Umaru Musa Yar'dua (UMYU) Pre-Degree and Remedial studies programme Supplementary List of for the 2017/2018 academic session is out and available on the school portal. The school management also brought to our notice that both the 1st and 2nd batch as well as the Supplementary list have been released. 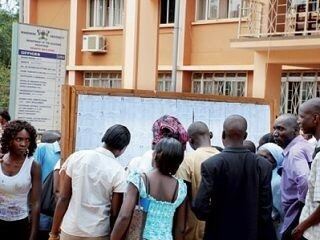 They also adviced aspirants to check their admission status as soon as possible so as to avoid late registration. Kindly use the links below to view UMYU 2017/2018 Pre-Degree/Remedial Studies Supplementary Admission List of admitted candidates into the Programmes. Candidates admitted into UMYU are hereby informed that school mangement has released her 2017/2018 UTME merit admission list. You can now check the names of admitted candidates online on the school;s official website. Congratulations to candidates admitted intoUmaru Musa Yar'dua University (UMYU) ! UMYU School of Pre-Degree/Remedial Provisional Admission List 2017/18. The management of Umaru Musa Yar'dua University, Katsina (UMYU) School of Pre-degree and Remedial Studies wishes to inform candidates offered provisional admission for 2017/2018 academic session that their admission list is out and available online. Names of admitted candidates has been published online and available on UMYU school portal click the link below to view. Please after checking your 2017/2018 UMYU School of Pre-Degree/Remedial Provisional Admission status via the above link, do not forget to use the share button. Thank you. Umaru Musa Yar'dua University, Katsina 2017/2018 Post-UTME Aptitude Test Results is out. All prospective candidates who participated in the admission screening exercise should please take note of this and also endeavor to check their results. 2. Enter your UTME number and password in the box provided. 3. Finally click on LOG IN to check your Aptitude Test Result. required to print their admission letters and continue with the registration process. printer to print your admission letter. personalized page including your most recent passport photograph (Snapped on RED background), signature, email address, home address and phone number. a) The system will automatically redirect you to the payment page immediately you click the ‘Save Profile’ button as described in step 2 above. 2. College Pay: Use this option to pay online with your ATM card via the Interswitch Platform. Please contact Registration Helpdesk on registration.helpdesk@umyu edu.ng or +23465290261, +23465290247 and +23465290279 for inquiries related to new students’ registration. - Please ensure that all the information supplied above is to the best of your knowledge correct. end of the page to complete your registration.